Like all such agreements, the Trans-Pacific Partnership’s ambition is to “grow Made-in-America exports” and “to provide new and meaningful market access for American goods and services exports”. How dynamic are these eleven countries likely to be in the future? 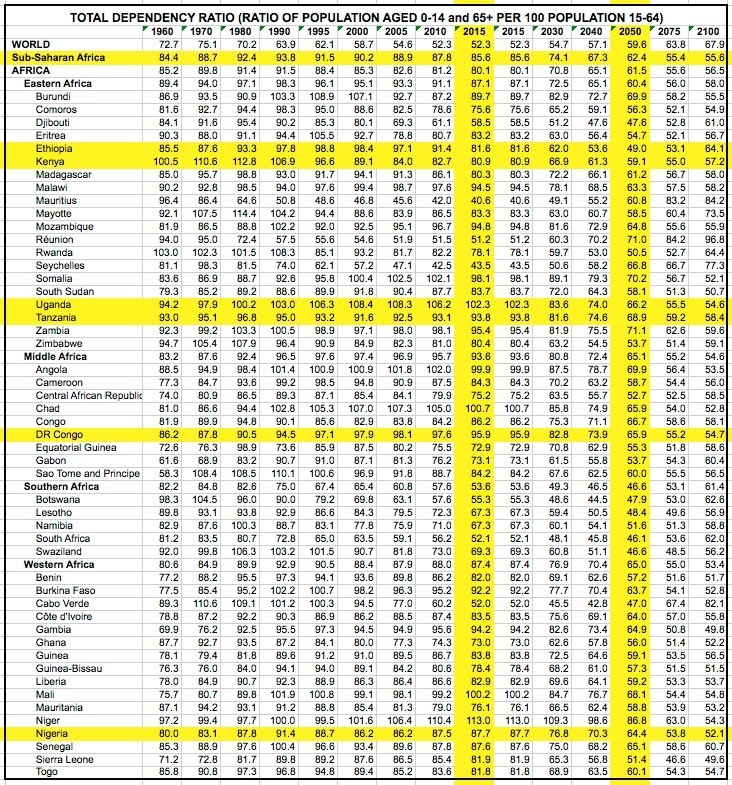 This table shows the countries (ex-USA) that are parties to the TPP, and their working age populations for the rest of the century. The size of the total population aged 15-64 in all of these countries combined is growing by less than 1% per year. Average annual GDP growth was 3.2% in 2010-14, but weighted by size of GDP, it was only 1.5%. 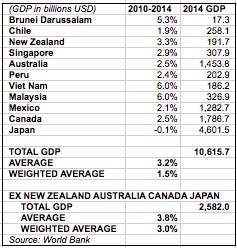 Excluding Australia, New Zealand, Canada and Japan, weighted average GDP growth was 3%. And total GDP, excluding these four countries (and the US), was $2.6 trillion in 2014. In the long run, it is likely that these economies will accelerate, in part due to the TPP, but this would require a leap in productivity, in reforms, and in the ability to attract foreign capital. In the near term, acceleration could prove difficult in the face of falling commodity prices, slowing emerging economies and deteriorating demographics. On the last point, as shown in the table, each and every one of the TPP countries will have a rising dependency ratio for decades to come. Note how dependency ratios fell sharply everywhere in the 1960-1990 period, leveled off or drifted down in 1990-2000, and then started to rise first in Japan and later everywhere else. Looking further afield, we may look at sub-Saharan Africa in a similar vein. How likely is it to grow rapidly in the next few decades? And should the US consider a trade deal with that region? From a demographic standpoint, it is well known that sub-Saharan Africa is by far the most dynamic and fastest growing region of the world. On current UN estimates (medium variant), its population aged 15-64 is expected to grow from 518 million today to 1.31 billion people in 2050. 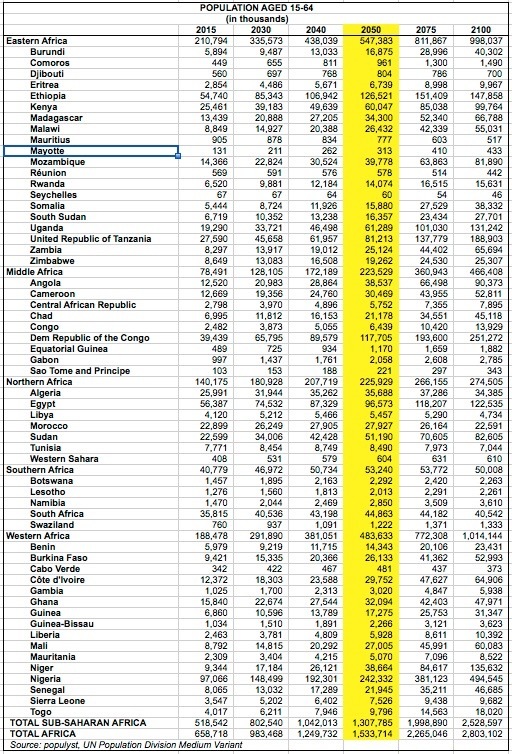 As shown in the table, the biggest contributors to this growth will be Nigeria (145m), DR Congo (78m), Ethiopia (72m), Tanzania (54m), Uganda (42m) and Kenya (35m). The total 2014 GDP of sub-Saharan Africa was only $1.7 trillion in 2014, tiny compared to the total of TPP countries, but not very far from the total $2.6 trillion ex-USA, Australia, New Zealand, Canada and Japan. Sub-Saharan GDP growth was faster with a weighted annual average of 4.9% in 2010-14. In terms of dollar units of GDP, growth in sub-Saharan Africa is not far above the growth achieved by TPP countries ex-USA, Australia, New Zealand, Canada and Japan. It is adding $81 billion of new GDP every year, vs. $77 billion in the emerging TPP countries taken together. But sub-Saharan Africa has a booming population and a declining dependency ratio, a potent combination which has often in the past produced sustainable economic growth. Its working-age population will grow by 150% in 2015-50, compared to only 18% for the aggregate fastest growing TPP populations. Unlike in TPP countries, dependency ratios across sub-Saharan Africa are expected to decline strongly from a total of 85.6 now to 62.4 in 2050. See table at the bottom of the article. Highlighted are some of the countries with the largest populations. Assuming that per capita GDP remains at current levels, GDP in sub-Saharan Africa would significantly outpace that of the TPP group. In addition, any rise in per capita GDP would further boost sub-Saharan Africa vs. the TPP nations. Growing GDP is a big challenge and an opportunity. As discussed in Providing Electricity to Africa by 2050, the lack of adequate infrastructure remains a difficult but not insurmountable obstacle to African growth. It is also a huge opportunity for energy companies. The TPP may produce positive results for participating economies. But the US economy can also record significant gains in 2015-50 by facilitating trade with sub-Saharan Africa.